"William C. Martell is the Robert Towne of made for cable movies," (Washington Post reviewer) David Nuttycombe. How many screenwriting teachers make their living actually writing and selling screenplays? His two Showtime Films include BLACK THUNDER, about a stolen stealth fighter plane, starring Michael Dudikoff and Richard Norton and a sci-fi film (both produced by Andrew Stevens, producer of Jack Nicholson's THE PLEDGE and the Bruce Willis-Matthew Perry film THE WHOLE 9 YARDS and its sequel). He has written a couple of CineMax Premieres like action-thriller TREACHEROUS which stars Tia Carrere, C. Thomas Howell, and Adam Baldwin (from 20th Century Fox), the martial arts vampire flick NIGHT HUNTER and military action flick THE BASE (starring Mark Dacascos), plus a USA Network thriller. His noir thriller HARD EVIDENCE (starring Gregory Harrison and Joan Severance - from Warner Bros.) was "video pick of the week" in over two dozen newspapers, was a Blockbuster featured new release, and beat the Julia Roberts film "Something To Talk About" in video rentals when both debuted the same week. He is the West Coast Editor of Scr(i)pt Magazine (the largest circulation screenwriting magazine in the world) where he has written the "Independents" screenwriting column for over a decade, a contributor to Writer's Digest Magazine and a past columnist for The Hollywood Scriptwriter Magazine. He was Entertainment News Editor for Dean (INDEPENDENCE DAY) Devlin's Eon Magazine, wrote the Screenwriting 101 column for the Independent Film Channel Magazine, and was the only non-nominated screenwriter mentioned on "Siskel & Ebert's If We Picked The Winners" Oscar show in 1997. He is a frequent contributor to Ebert's Movie Answer Man syndicated column and Ebert's annual Year In Film books. He was on the jury of the Raindance Film Festival (London) in 2001 (with director Mike Figgis and actress Saffron Burrows) and again in 2004. See a video interview with Mr. Martell from London's The Writer's Room (from the BBC). Mr. Martell has been interviewed in Variety (February 24, 1997), featured in The Hollywood Reporter's first Writers Special Issue (February 1994), was the cover interview in The Hollywood Scriptwriter (October 1996), and was interviewed in the first issue of ScreenTalk Magazine (Denmark). Entertainment Today (March 23, 2001) named his website Scriptsecrets.net the Best On The Web for screenwriters. Past students of Martell's big two day class have sold scripts to Miramax, George Clooney's Section Eight Productions, Joel Silver Films, and the amazing Steve Robinson took what he learned in the class and wrote the winner of the Nokia International Short Film Competition, "Have I Passed?". Mr. Martell has taught screenwriting courses at Sherwood Oaks College in Los Angeles, for Project Greenlight in Los Angeles, at the Cripple Creek (Colorado) Film Festival, the Ft. Lauderdale (Florida) Film Festival, the Temecula (California) Film Festival, several times at the Santa Fe Screenwriters Conference along side Oscar winners William Kelley (WITNESS), David S. Ward (THE STING), and Oscar nominees Chris DeVore (THE ELEPHANT MAN) and Mark Medoff (CHILDREN OF A LESSER GOD), twice at the Las Vegas Screenwriting Conference along side Steven Katz (SHADOW OF THE VAMPIRE), Shane Black (LETHAL WEAPON), and Ross LaManna (RUSH HOUR), and three times taught classes at the Sacramento (California) Film Festival. His two day Naked Screenwriting class has been offered by the Raindance Film Institute in London for the past five years, and the Los Angeles versions of the class have been very successful. Under the new name Script Secrets, the big 2 day class will travel to a number of cities in 2005. 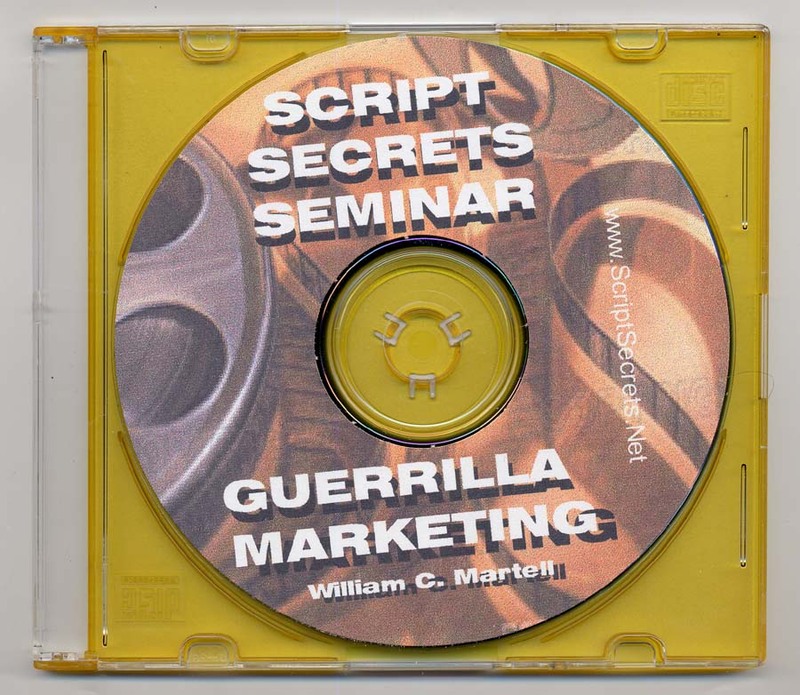 Mr. Martell's book, THE SECRETS OF ACTION SCREENWRITING (First Strike Press) has been called "The best book on the practical nuts-and-bolts mechanics of writing a screenplay I've ever read." - Ted Elliott, co-writer "The Mask Of Zorro", "Shrek", "Pirates Of The Caribbean". "William C. Martell knows the action genre inside out. Learn from an expert!" - Mark Verheiden, screenwriter, "Time Cop", "The Mask" and TV's "Smallville". "This book is dangerous. I feel threatened by it." -Roger Avary, Oscar winning screenwriter, "Pulp Fiction". "My only complaint with SECRETS OF ACTION SCREENWRITING is that it wasn't around when I was starting out. The damned thing would have saved me years of trial and error!" -Ken Wheat, screenwriter, "Pitch Black" and "The Fly 2". "Finally a screenwriting book written by a working professional screenwriter. Bill Martell really knows his stuff, showing you how to write a tight, fast screenplay." - John Hill, screenwriter, "Quigley Down Under". Mr. Martell is currently working on projects for major studios. His eighteenth film, SOFT TARGET, just wrapped principal photography and will be released in 2005. Mr. Martell was born in the same hospital, in the same month, as Tom Hanks. Many believe they were switched at birth, and Bill should be the movie star. He lives in Studio City, California, and can be found most afternoons at Priscilla's coffee house in Toluca Lake writing some darned new script on his laptop. What screenwriters do you absolutely hate? What films are over-rated? Are the Oscars rigged? Is Mel Gibson's APOCALYPTO one of the signs that the world is about to end? Be heard: Movie Discussion! My friend Jeff Burr's movie is SAVING PRIVATE RYAN meets FREAKS! SWEET SEVENTEEN! This weekend only! Order all seventeen available Blue Books and get the Indie Red Book and the special edition Producer's Guide absolutely FREE! The Producer's Guide contains addresses, phone numbers and contact information for over a hundreds producers - it's a $15 value! Add the $10 Writing Indies Red Book and you save $25 with this offer! The SWEET SEVENTEEN Blue Book Deal includes the Secrets of: Ideas, Outlines, Structure, Story, First Ten Pages, Protagonists, Visual Storytelling, Dialogue, Descriptions, Scenes, Supporting Characters, Act Two, Blockbusters, Great Endings, Rewrites, Treatments & Loglines, and Selling Your Script! Almost everything you need to know! Each Blue Book is 48 pages* packed with information! This deal ends Monday, so act now! For more information about BLUE BOOKS - SWEET 17 Limited Time Offer!